From my house, if I jump on I-55, I can be at my wife's alma mater in about 90 minutes. Go another hour and a half and I would show up at one of the many hometowns of the Simpsons, the capital of Illinois Springfield. Three more hours down 55 (six hours total) and I arrive in St. Louis. I'm sure the Cubs didn't bus or train their way there last week when somehow they got past the Cardinals and are currently facing the Mets. The fact now that I have to hear nothing but Cubs this and Cubs that on the news and the radio I place squarely on Kerry from Cards on Cards. I know you are thinking "but how can a blogger be at fault"? 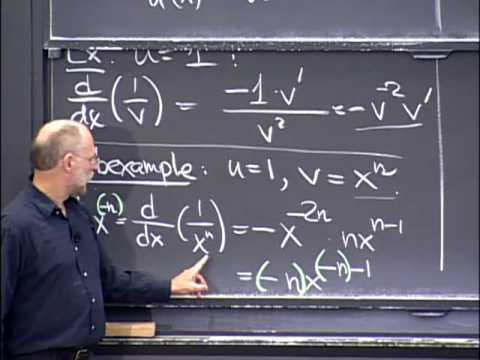 Trust me - I had someone run the numbers and I was equally surprised at the result, but you cannot fault science fact. Here is Cruz's inability to hit the slider. I am hoping the Mets do their due diligence or this will make for a long winter for this Sox fan. Thankfully, Kerry dropped some cards on me a while back, and for that fact, I have them running the numbers again to see if there is some other fault. Until then, here's some of what Kerry sent over. Some fine amount of glorious junk wax in that package, which is always welcome here. There is so much out there, and my Sox box can really be lacking in the years. The Pacific Durham and Fleer McCaskill were welcome additions to the respective years. 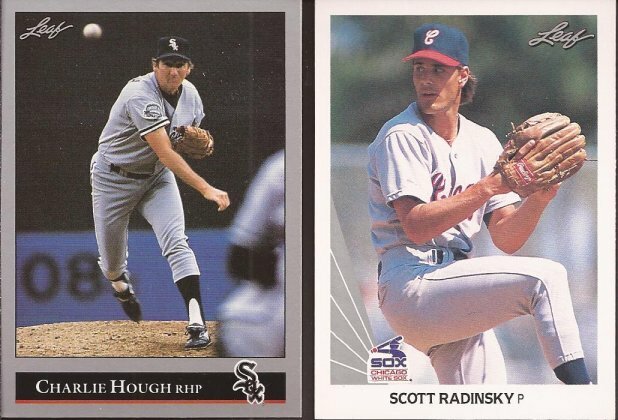 Along with knuckleballer Hough and Radinsky. 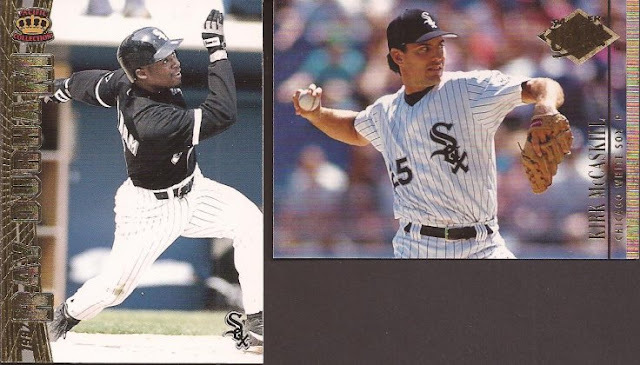 I forget how old the current uniform set is for the White Sox that Hough wore it. 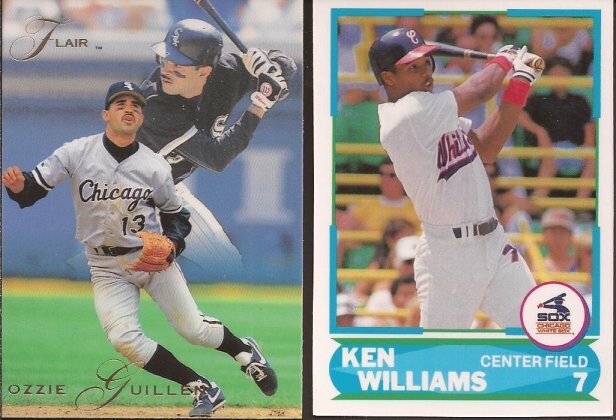 Both of these are of the super shiny junk wax, with Flair and its heavy gloss on the thick cards, and Williams being the Tiffany Score, or whatever term they use for the high glossed set. Not to say the package was all mid 90's wax. Plenty of current was to be had as well. 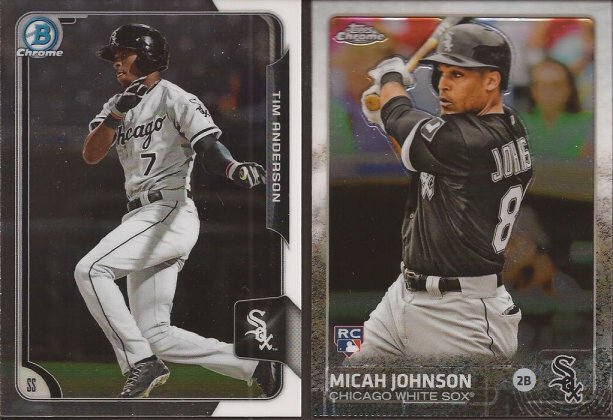 I could start a pretty decent Micah Johnson collection with all the cards sent to me, but I don't expect him to be with the club too much longer. He'll probably get traded as a throw in player somewhere. No trade envelope from Kerry would be complete without an autograph. 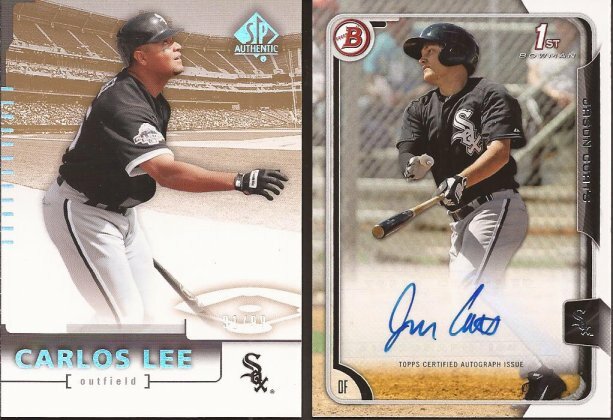 I seem to pull a lot of Cardinals (like the package that just when out a couple weeks back) and Kerry has a line on ChiSox scribbles. Coats is currently in AAA ball for the Sox, slowly working his way up the pipe since being drafted a couple years back. We'll see if he cracks the roster in 2016. Thanks for the package Kerry. The numbers just came back and you weren't accountable. Turns out the professor carried a 2 when he should have carried a 3. Appropriate steps have been taken. Alright - game 3 between the Mets and Cubs starts soon. Keith, I hope I don't have to put the blame on you.